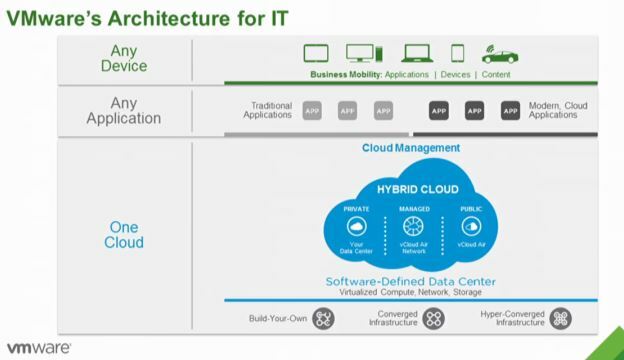 VMWare’s architecture for the future is – the complete software defined data centre. Manage any application on any device, hosted in a hybrid cloud – One Cloud. This was the real focus of the presentation, that of VSphere 6 as part of a software defined data centre. VSAN – Jumps version numbers to VSAN 6.0. Twice the scale and 4 times the performance versus 1.0. Available in hybrid and now all flash. VMotion across data centres and long distance VMotion. The key news for 3PAR fans was obviously the VVOL’s stuff. Check out my previous post on how VVOL’s may change the way we work with 3PAR. 3PAR has been part of the VVOL programme from day 1 and was the reference partner for FC . Check out this detailed video from Calvin Zito which gives a brief over view of the concepts and then dives into a demo with 3PAR. The policy driven stuff looks really good. Most importantly my guess this would be the VSphere 6 launch was correct and I therefore don’t need to undertake the forfeit of changing my domain name to VNXDude.com.